Alternative classical composer Phillip Bimstein lives in Salt Lake City and Springdale, Utah, where he served two terms as mayor. A recipient of grants and awards from the National Endowment for the Arts, Meet The Composer, American Composers Forum, Austria’s Prix Ars Electronica and an Emmy Award from the National Academy of Television Arts & Sciences, Bimstein’s music has been performed at Carnegie Hall, Lincoln Center, the Kennedy Center, the Bang on a Can Festival, the Aspen Music Festival, the Spoleto Festival and London’s Royal Opera House. Ensembles who have performed Bimstein’s works include Relâche, Turtle Island String Quartet, Modern Mandolin Quartet, Present Music, Abramyan String Quartet, Sierra Winds, Equinox Chamber Players, the California E.A.R. Unit and Corky Siegel’s Chamber Blues. Bimstein was born in Chicago and is a graduate of Chicago Conservatory of Music, where he majored in theory & composition. In the 1980s he led the new wave band Phil ‘n’ the Blanks, whose three albums and six videos were college radio and MTV hits. After further studies at UCLA in composition, orchestration and conducting, Bimstein took a hiking trip to southern Utah and never left. 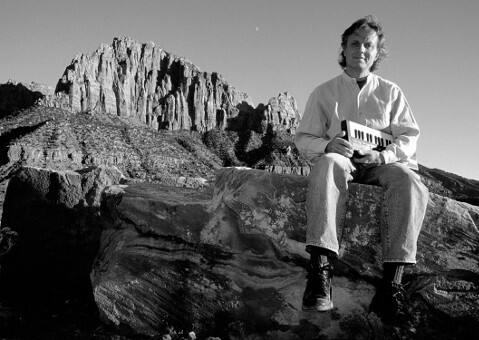 In 1997 Bimstein was awarded Meet The Composer’s largest grant, the three-year New Residencies, during which he composed music that celebrates and explores the intimate relationship between the landscapes of the desert southwest and the many cultures that have inhabited the area. One of the residency-created works, Half Moon at Checkerboard Mesa, has been performed by well over 150 musicians all over the world. Fascinated by language and the ability of music to tell a story, he frequently incorporates text in his work. Refuge, his string quartet based on the book by Utah naturalist Terry Tempest Williams, was described as “sublime - elegant perfection” by the Deseret News. In 2005 Bimstein composed Lockdown, a techno tone poem based on the sounds and voices of a youth crisis center in southern Utah. In addition to public concerts, the work is presented as dialogue-promoting outreach to youth detention facilities and prevention programs. In 2006 Bimstein received his second Continental Harmony grant from the American Composers Forum to compose Zion Canyon Song Cycle based on the historical and contemporary stories of his community. Performed by his Americana folk chamber group Red Rock Rondo, it is the subject of an Emmy Award-winning PBS -TV music special, which also won Bimstein an Emmy for music composition. In 2011 Bimstein composed a new song cycle for Red Rock Rondo and the Salt Lake Sympony based on the best-selling book by Ted Gup, A Secret Gift.